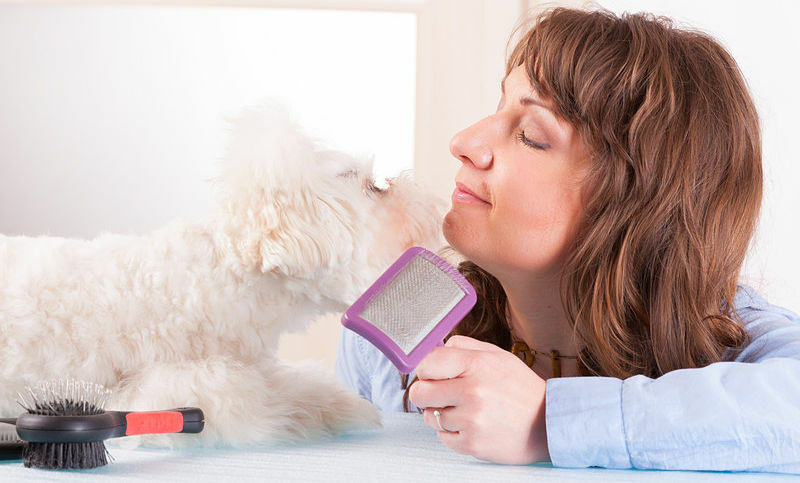 Knowing how to groom your dog is a useful skill for any dog owner to have. A professional dog groomer will keep your dog looking beautiful. But what if you don’t have one locally or you simply want to save yourself some money? In that case you can easily give your dog a basic grooming at home by following this guide. Grooming is simply the task of ensuring your dog’s nails, skin and coat are clean and well maintained. Many dogs will just need a good bath, hair brushing and nails clipping while others will need a much more complicated style of hair clipping. Whichever kind of dog you own, this article will give you some advice on how to groom your dog like a professional. Brush your dog before you begin the grooming as any matting will become hard to deal with once the hair is wet. Remove the collar and then start by brushing the neck and move slowly down the body, including the tail. Take care when brushing under the belly because this can be a sensitive area for dogs. Make sure to also include the legs, although these usually require less attention. If your dog is short-haired you can use a curry comb to do the brushing. If your dog has longer hair you should use more specialized brushes such as slicker or pin and bristle brushes. If your dog’s coat has matting or tangles, use the de-tangling spray. If there is any matting or tangling that you can’t brush out using the de-tangling spray, it will need to be either cut out with scissors or shaved out, depending on how close to the skin it is. If you are cutting it out with scissors take extreme care and go slowly and gently as you do not want your dog to be startled and hurt you or itself on the scissors. As you go along remember to take your time, giving your dog breaks as and when needed, and constantly talking to it and reassuring it. When finished, give your dog some praise and treats as a reward and give it another short break. Make sure the dog’s eyes are clean and clear of any debris. Breeds with white hair will require more attention at this stage, as will those with large, watery eyes. If necessary, use tear stain remover to remove stains from the coat. Bring some ear cleaning solution to body temperature by placing it in warm water just like you would with a baby’s bottle. Apply the ear cleaning solution to a cotton wool ball and wipe and scrape any wax or dirt from the dog’s inner ears, but take care to only wipe gently so as not to damage the ear and make sure not to push the cotton wool too far into the ear. You will hopefully be brushing your dog’s teeth every day anyway but if not, now is the time to brush its teeth. You must take extreme care at this stage to make sure you are not bitten, if your dog is not used to having its teeth cleaned. Make sure you use specialist dog toothpaste, not human toothpaste. Learning how to clip your dog’s nails is a vital part of knowing how to groom your dog. It’s a part of dog grooming that needs special care and attention. You should clip your dog’s nails on a regular basis, depending on how quickly they grow of course. When clipping, have some styptic powder to hand in case you cut too far. If your dog has clear nails you will be able to see the pink part containing the blood vessels. This part should not be clipped – just clip a small amount from the hard, clear part. With dogs that have dark nails, it is harder to see so take extra care and go slower. Clip just a sliver at a time and then check the exposed end of the nail after each clip – once a gray or pink oval starts to appear it is time to stop. Reward your dog with a treat after you have clipped each nail, and keep talking and reassuring it throughout the clipping process. Now it’s time to bathe your dog. You should make sure your dog is completely wet before applying any shampoo. Lift the long hair and spray down to the roots to ensure it is thoroughly wet. If you do not do this, your dog’s skin may become itchy later on. If your dog is very dirty let the water drain away as you wash it, rather than letting it stand in the dirty water. Make sure the water is warm before you start – test it on your inner arm – then begin by shampooing the neck and working down the body to the tail. Use your fingers to spread the shampoo and massage it into the skin. A good tip is to dilute the shampoo to make it easier to spread and work in. Wash the head last using a flannel or cloth and do not use shampoo or soap around the eyes and ears. Once the dog has been completely washed, rinse thoroughly. Keep rinsing until you can no longer see any soap bubbles or dirt coming off. Let any remaining water drain from your bath tub and then towel dry your dog as much as you can before letting it out of the bath. Put your hair dryer on the cool setting and then dry the hair until it is completely dry. If your dog has longer hair, you may need to brush it as you do this to prevent tangles. An essential part of knowing how to groom your dog, especially a fluffy one, is knowing how to clip them. When clipping your dog with electric clippers, make sure you always use cooling lubricant on the clipper blades to prevent them from getting hot and hurting your dog. Also, keep your clippers well maintained and the blades sharp because the blades will catch and pull the hair if they are not sharp. During the clipping, keep checking the clippers to make sure they are not getting too hot. Select the right sized comb for your dog’s hair length, and then begin clipping in an inconspicuous area where the coat has not grown too long just to check that you are using the right blade and comb. Once you have determined that you have the right blade and comb, begin clipping at the neck. Move the clippers slowly and smoothly along the dog’s body in the direction that the hair grows. Start at the neck and under the ears, then move down to the shoulders and then the chin and throat. Next do the back and sides, down to the tail and then finally do the legs. Take extra care when doing the legs, face and tail as these are sensitive areas for your dog. Remember to keep reassuring, encouraging and praising your dog throughout the process and have frequent short breaks when you reward them with treats. It is always best to get a professional dog groomer to groom your dog if possible, to get your dog looking their absolute best. When that is not possible, if you follow this guide on how to groom your dog yourself then there is no reason you cannot do a little home grooming when circumstances dictate.